Barreleye fish, the name itself suggests a hint of peculiarity. The deep sea has always amazed us with bizarre creatures, and the Barreleye fish is one of them. Also known as Spook fish, this tiny unusual fish has transparent head with upward facing barrel shaped eyes. Barreleye Fish are found in the deep waters of Atlantic, Pacific and Indian Ocean. Barreleye fish is one of nature’s finest creations. One look at the fish and one can just wonder at the amazing creature which might look like some weird creation for a Hollywood sci-fi movie. The fish has a dome shaped transparent head. It has an ultra sensitive tubular eyes covered by a green fluid shield which helps them locate prey overhead even at pitch dark depth of the sea. The two oval-shaped olfactory organs (similar to human nostrils) located above their mouth is often mistaken as their eyes given them a sad look. Their cylindrical eyes are imbedded inside the transparent head facing upward. They have a small mouth with a pointed snout. Their elongated flat fins allow them to float motionlessly. The Barreleye fish have luminous organs throughout the length of their body. The Barreleye fish were discovered by the marine biologist, Chapman in 1939. However, the transparent head of the fish and its specimen were unknown till 2004. Earlier, when the barreleye fish were caught, the fragile structure of its head were destroyed by the net while bringing them to the surface. However with the advent of technology live specimen of the fish and its transparent head feature was captured by researchers on special cameras. Researchers named Robinson and Reisenbichler observed and filmed the Barreleye fish in their natural habitat and even kept the specimen in the aquarium for closer study. Study of the specimen indicates that the barreleye fish lay their eggs and release them into the water. The fertilized eggs when released directly into the water are light and the larvae floats in the shallow depth of the water. As the larvae transmutes, they descend into the deeper sea. Barreleye fish are deep water fish mostly found off the coast of California and the North Pacific region. They are found mainly at a depth of 3330 ft. The Barreleye fish are ambush predators. They stay motionless while their eyes face upward. The green shield in their eyes filter the light from the surface of the sea, making it easier to spot the glow of the jellies swimming around. As they detect their prey, they swim upward to grab them. The barreleye fish have strong digestive system and they usually feed on jellies and small drifting animals. 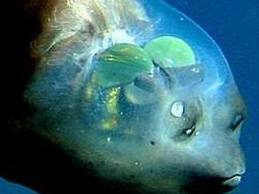 The small marine creatures trapped on the tentacles of the jellies are also targeted by the barreleye fish. Scientists are amazed by the distinct eye design of the barreleye fish. They believe that the eyes of the fish might have evolved separately. Their eyes are embedded inside an upward-facing transparent dome, but researchers were amazed to find out that the tubular eyes could actually rotate. The green shield around the eyes is an optical clarifying filter that filters the surface light. Their upward facing eyes can scan the prey overhead. The unique eyes of the barreleye fish were unlike any other vertebrate. Such design feature according to evolutionary scientists might not have evolved with just the natural force unless it was directional. It is still unknown, however every living animal have predators. This unusual fish has various amazing ways to adapt to the pitch dark environment of the deep sea. Imagine living in the depth of the sea where the faint sunlight fades into utter darkness. The ultrasensitive tubular eyes of the barreleye fish detect their prey even in the pitch dark environment. Barreleye fish have flat fins which easily allow them to stay motionless inside water. The fish hangs motionless waiting for its prey in a horizontal position; they swim upward when they spot their prey. Their small mouth allows them to capture small preys very precisely. The digestive system of the barreleye fish is strong which allows them to digest variety of small drifting animals and jellies. 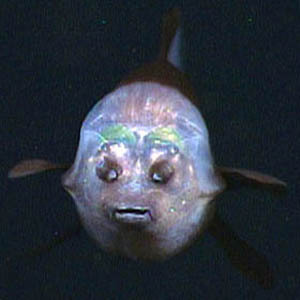 This bizarre deep sea fish have a transparent head. 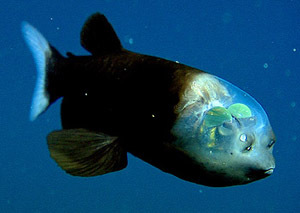 Barreleye fish gets its name due to its barrel shaped eyes which are embedded inside their transparent head. It was earlier believed that they have a ‘tunnel vision’. However, it was proved that they can rotate their eyes within the transparent shield. 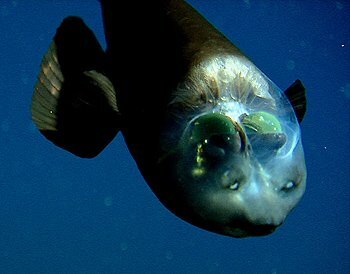 Here are some of the pictures of the bizarre barreleye fish. That was an amazing article about the Barreleye Fish. I never knew how much you could learn about this fish until today.